Ceasefire Oregon Education Foundation – The Ceasefire Oregon Education Foundation works to reduce the number of gun injuries and deaths in Oregon by educating the public and providing opportunities to dispose of unwanted firearms. According to Gun Violence Archive, 109 people were fatally shot in Oregon in 2018. That number excludes suicides. Ceasefire Oregon expects 2018 firearm-related suicides to exceed 400. Of the 109 fatal shootings, six were classified by GVA as accidental. Twenty-six people (all men) were fatally shot during an officer-involved incident. Nineteen were fatally shot by an officer, seven fatally shot themselves. The Ceasefire Oregon Education Foundation works to reduce the number of gun injuries and deaths in Oregon by educating the public and providing opportunities to dispose of unwanted firearms. Join the Ceasefire Oregon email list to keep up with the gun violence prevention movement. Find out more about COEF's gun turn-in. Pledge to ask and keep your children safe. 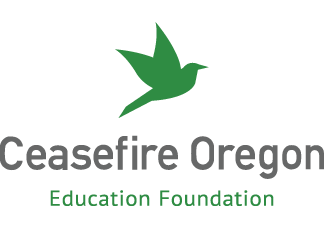 Learn about the Ceasefire Oregon Education Foundation. You can help prevent gun violence.